Happy Memorial Day! Wow! I see that it is exactly one year Anniversary since I posted about my tour of two gardens here in Salem. Well, the irises are in full bloom and my peonies are only a little behind. Last week we went to Adelman’s Peony Farm, and everything was blooming there. I did manage to get out of there without any new peonies, although I had my eyes on one that was an Intersectional Itoh Hybrid Peony on sale for half price. I was reminded that we still hadn’t planted the Peony we bought last year and had no room. Still it was wonderful walking around the display garden which is lovely. We had stopped at Schreiners Iris Farm first, but they were now charging for parking, which annoyed us since we have spent hundreds of dollars there. We didn’t see parking on the road, so we left and went to Adelman’s. We will probably go back and try to find road parking, because this display garden is really lovely. 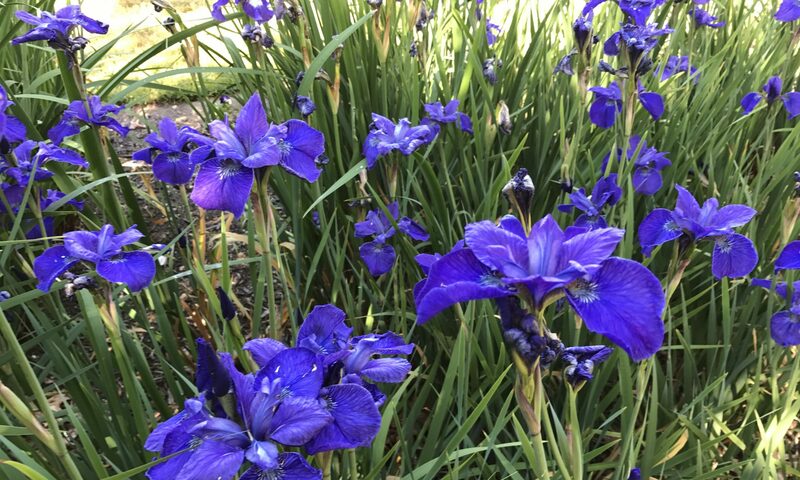 In the mean time we are enjoying our own irises. Now our plan for Memorial Day is to sit out on the deck and not do much besides water the garden. Of course, later today we will haul out the Traeger Grill and grill some trout and corn. Yummm! Now, just so you know, I have moved this website to the WordPress servers. It is so nice to have all my Websites in one place where it is easy to interlink them all. Maybe I’ll be able to post a little more. Yay!